OK… you caught me. It’s not really a lane. It’s really just the way-too-narrow space between my house and the neighbor’s house. But it does have wisteria! This is the view out my bedroom window right now. I love waking up in the morning and peeking out the curtain to see these lovely blooms hanging down. During most of the summer, I have a constant battle to keep the wisteria from growing on to the roof and tearing it off, clinging to the gutters and tearing them down, and generally being a nuisance and taking over. 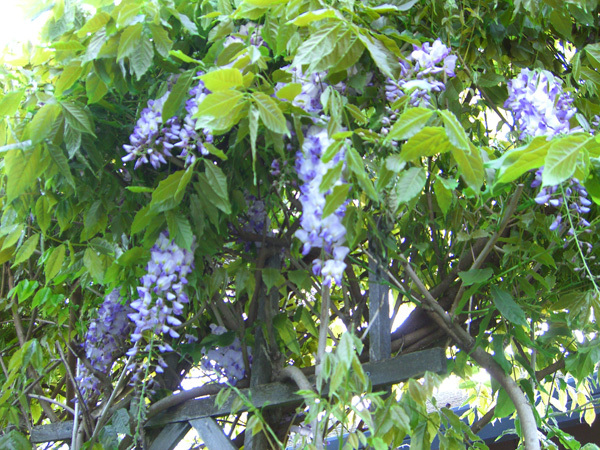 But in the spring while the wisteria is blooming, the challenges become definitely worth while. Sockapalooza sounds fun! How does one join and can you tell me more about it? Sockapaloooza is a giant sock exchange organized by Alison from the blue blog. I think this is the 3rd sock exchange that Alison has hosted. Sign-ups are only open for a short while. After sign-ups close, everyone is sent info on the person they will be knitting socks for, and then has three months to get the socks completed. On the appointed day, everyone mails their socks off to their sock recipient. This time 606 people from all over the world participated — check out the map. It is a lot of fun. I’m not sure when the next one will be, but keep watching on Alison’s blog for news and updates.